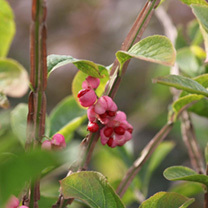 Euonymus phellonamus, a compact evergreen shrub with large dark green leaves with stems conspicuously corky-winged. Attractive four-lobed pink fruits. Easily kept to 4'. White flowers from May to June. Height 200-250cm.